Elijah Cummings was born on January 18, 1951 in Baltimore, Maryland. He earned a BA in political science from Howard University in 1973, and a JD from the Maryland University School of Law in 1976. From 1980-96, Cummings worked as a private-practice attorney and served in the Maryland State House of Delegates. On April 16, 1996, he won a special election for the U.S. House of Representatives seat that became vacant when Rep. Kweisi Mfume resigned from Maryland’s 7th Congressional District in order to take a job as president of the NAACP. Cummings has held that seat ever since. He is a member of both the Congressional Black Caucus (which he once chaired) and the Congressional Progressive Caucus, and was formerly a member of the Out of Iraq Congressional Caucus. To maximize the effectiveness of his re-election campaigns and political initiatives, Cummings has used the services of Robert Creamer‘s Strategic Consulting Group. In January 2001 in Greenbelt, Maryland, Cummings spoke at the Working Families Legislative Conference, an event co-sponsored by Progressive Maryland and the Campaign for America’s Future. This gathering focused on ways to link local Maryland issues with a national progressive agenda vis-a-vis such matters as living-wage laws and the public financing of “affordable housing,” health care, after-school programs, and political campaigns. Another featured speaker at the conference was Robert Borosage. When the House of Representatives voted by a 345-75 margin to defund the notoriously corrupt community organization ACORN in September 2009, Cummings was one of the 75—all Democrats—who voted to continue funding the group. On January 27, 2010, Cummings was one of 54 Members of Congress who signed a letter calling on President Barack Obama to apply diplomatic pressure to end Israel’s blockade of Gaza—a blockade which had been imposed in 2007 to prevent the region’s Hamas-led government from importing weaponry, particularly from Iran and Syria. On July 28, 2010, Cummings joined Rep. Barbara Lee and former “green jobs czar” Van Jones in addressing that year’s installment of the 21st Century Democrats‘ Youth Leadership Speaker Series, an event sponsored by Rep. John Lewis and Senator Tom Harkin. In 2012, Cummings falsely stated that True The Vote (TTV), a Texas-based organization which supports Voter ID laws as a means of ensuring honest and valid political elections, “will do almost anything to stop people from voting”—i.e., that it tries to “intimidate” and “harass” minorities with “very confrontational” tactics, in hopes that they will “turn away” from their polling places. In a letter he sent directly to TTV, Cummings charged that its “effort to challenge voter registrations by the thousands without any legitimate basis may be evidence of illegal voter suppression” and “could amount to a criminal conspiracy to deny legitimate voters their constitutional rights.” In a number of additional, lengthy letters to TTV, Cummings claimed that he was involved in a House Oversight Committee investigation of the group. But by law, that Committee is only permitted to investigate government agencies, not private citizens. Testifying before Congress in February 2015, the founder of True The Vote, Catherine Engelbrecht, stated that after she had filed an application to have the IRS grant tax-exempt status to her organization, that agency—along with the FBI, ATF, and OSHA—began targeting and harassing her. This was part of a much larger scandal whereby the IRS delayed, obstructed, and rejected hundreds of such applications by conservative groups. Cummings’s involvement in this scandal became apparent in 2014 when the House Oversight Committee released a number of emails proving that: (a) Cummings and his staff members had communicated with the IRS multiple times during 2012-13, and (b) the IRS and Cummings’s staff had asked for nearly identical information from Engelbrecht about her organization’s volunteer activities and training methods, indicating a coordinated and improper sharing of confidential taxpayer information. Prior to these revelations, Cummings had adamantly denied that he and his staff had made any inquiries to the IRS about TTV that may have led to additional scrutiny from the agency. Cummings’s transgression was a crime that, if prosecuted, could be punishable by up to five years in prison. Cummings served as the ranking Democrat on the select House committee that was empaneled in May 2014 to investigate the Islamic terrorist attacks that had killed four Americans at a U.S. diplomatic facility and a nearby CIA annex in Benghazi, Libya on September 11, 2012. In May 2015, Cummings denounced the entire investigation as a Republican-led “political charade” and “partisan attack” that sought only to harm the potential presidential candidacy of former Secretary of State Hillary Clinton. Mrs. Clinton’s willful and repeated failure to provide adequate security for the Benghazi facility—and her many subsequent lies about the nature and causes of the deadly events of 9/11/12—had drawn harsh criticism from Republicans. In January 2015, Cummings objected strenuously when Republican House Speaker John Boehner—without first asking President Barack Obama for his approval—invited Israeli Prime Minister Benjamin Netanyahu to speak to Congress on March 3rd about the gravity of the growing Iranian nuclear threat and his strong opposition to the deal that the Obama Administration was pursuing with Iran. 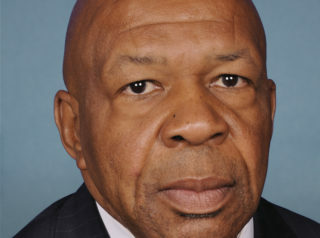 Cummings was one of numerous Congressional Black Caucus members who, because of Netanyahu’s act of “disrespect” against Obama, elected to boycott the speech. In April 2015, when the city of Baltimore was under curfew following nights of riots and destruction in response to the recent death of a local black criminal named Freddie Gray while he was in police custody, Cummings declared that most of the protesters were peaceful, and that their battle against police racism and brutality made them “without a doubt the civil-rights voice of this generation.” “America needs to wake up, big time,” he added. When the Daily Caller in February 2018 contacted Cummings and a number of his fellow Congressional Black Caucus members to ask if they would be willing to publicly denounce the notorious Nation of Islam leader Louis Farrakhan, Cummings was one of 20 who declined not only to denounce him, but also to issue any comment at all regarding his infamous anti-Semitic, anti-white rhetoric. Cummings is an enthusiastic supporter of the Council on American-Islamic Relations (CAIR) and its supporters, whom he praised in October 2011 for their “efforts to establish positive relationships and eliminate fear, mistrust, discrimination and violence.” Four years later, Cummings lauded CAIR for working “diligently to champion the rights of all Americans and make democracy work for everyone.” “Your leadership and steadfast commitment to fostering understanding and peace are inspiring,” he added. For an overview of Cummings’s voting record as a Member of Congress, click here. For additional information on Elijah Cummings, click here. Further Reading: “Elijah Cummings” (Votesmart.org, Keywiki.org); “Cummings: Racism ‘Has Something to Do with’ Obama Interruption” (Daily Caller, 6-15-2012); “Black Caucus Members Refuse to Denounce Hate Group Leader Louis Farrakhan” (Daily Caller, 2-7-2018); “Cummings: We ‘Should Definitely Reconsider’ If Trump Can Be Indicted” (Breitbart.com, 12-16-2018); “House Democrats Want ‘Oversight’ over Fox News’ Editorial Decisions” (Joel B. Pollack, 4-2-2019). “Rep. Elijah Cummings: Bald Faced Liar” (by J. Christian Adams, PJ Media, 10-26-2012); “Rep. Elijah Cummings Attacks Tea Party” (by J. Christian Adams, PJ Media, 10-5-2012). “New Emails Could Send Democrat Elijah Cummings to Prison for Targeting Voter Rights Group” (Gateway Pundit, 3-5-2015); “Rep. Issa Reveals Emails Between Rep. Cummings’ Staff and Targets of IRS Investigation” (Breitbart.com, 4-9-2014); “Emails reveal IRS collaboration with Democrat Rep. Elijah Cummings” (American Thinker, 4-10-2014).